For most businesses, the answer is yes. Social media has become such a huge part of a a modern business’ web marketing strategy that setting up guidelines for how your company and its employees are using Twitter, Facebook, or Instagram is crucial. We created the Social Media Corporate Approval Template to help you manage your marketing team’s activity on social media, without getting caught up in a messy approval process. It will also help mitigate any problems that might come up before they actually happen. The rest of this article will take a closer look at the most important components of this template. 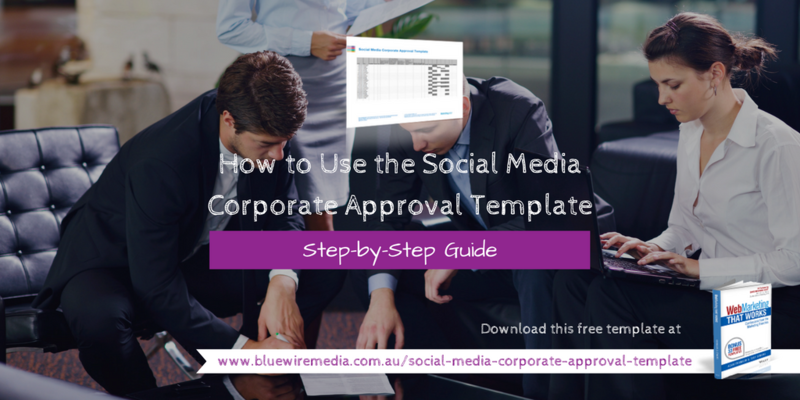 Bonus: Download the “Social Media Corporate Approval Template“ if you are managing multiple social media streams and multiple contributors. It will help ensure: appropriateness of message, error free posts, smooth management of those creating the content and those approving it. You’ll first need to determine why you’re creating a social media approval process for your team in the first place. Is your industry a highly regulated one where public perception is extremely important? Maybe your product or service has some sensitivities that you’d like to keep private? Or perhaps you are simply managing several social profiles and need some rules for your team to follow? Your approval process can help address these issues, and keep your social media strategy on track. It is an opportunity to educate your team on what is appropriate and respectful when it comes to presenting your company and themselves online. These may even be lessons that they will carry with them throughout their career, both offline and on. The idea behind this template is to make the approval process for posting online a streamlined and efficient way to get your company’s message to your audience. All whilst avoiding negative press and brand-breaking mistakes. The template is a spreadsheet that your team can all use to organise content and determine its approval and progress through the publishing process. The first section of the template simply accounts for the actual content that you want to share. The content goes in this column so the approval process can begin. Is it a blog post, e-book or something else? Where does that piece of content live and how can you share the link? How Will Your Audience React to This Content? If your content is provocative or controversial in any way, you’ll want to consider what kind of negative comments you might get as a result and be prepared to handle them. In a recent post entitled “Please, Please Don’t Ask Me to Like Your Facebook Page,” Beth Hayden revealed her irritation with the Facebook invitations she’d been getting from friends to like their pages. Her post was received well for the most part, but she did receive some negative comments. Along with your social media approval process you will want to assign someone to respond to any negative comments – so think about how your audience will receive the information that you’re giving them, and how you’re prepared to handle any backlash. Next you should consider the images that are being used. Anticipate at this stage whether your image could be misinterpreted by someone, or if they could spark a negative reaction. Also, make sure to check and see what the usage rights are on the images you post. This is another important step in the approval process. For example, if you aren’t purchasing your images or creating them in-house, where did they come from? Are you 100% sure they are royalty free images? If you’re using Google for an image search, you can filter through the results to find images that you will be able to use. In this step, you want to consider what your content is really saying about your brand and its overall message. Which part of your company’s culture are you trying to showcase or drive home to the audience? How do you want to be perceived in the market? For example, Basecamp is a popular project management platform that businesses and startups use to manage their workflow and project details. Their company blog is a huge resource for those startups, keeping the audience up to date on trends in business management and company culture. By publishing this sort of content on their blog and social channels, Basecamp is establishing itself as an authority in their industry and progressing their greater business goals. Finally, you’ll want to double check the entire piece of content and do a thorough proofread. Someone (or ideally multiple people) on your team should be assigned to read over your message before it goes live. Don’t leave it to chance that you’ve caught all of your own mistakes. When you’ve taken the time to work through these steps, you’ll feel a little safer hitting “publish,” when the time comes. This template will also help you to keep track of where you’ve published your content. And because you’ve taken the time to plan out your content and have a policy for approval in place, you’ll be ahead of the competition. It will also give you piece of mind that your brand isn’t at risk. What kind of approval process is in place for your team? Do you have a policy for negative comments? Bonus: Download the “Social Media Corporate Approval Template” if you are managing multiple social media streams and multiple contributors. It will help ensure: appropriateness of message, error free posts, smooth management of those creating the content and those approving it.